Swaraj said that the terror attack in Pulwama was a direct result of impunity and cover given to JeM by Pakistan. 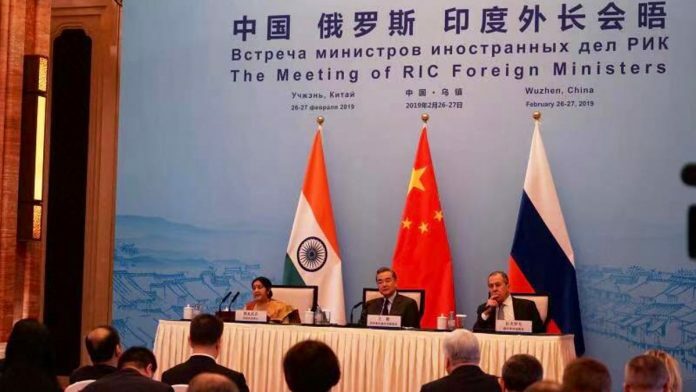 Wuzhen: The Pulwama attack is the direct result of the “impunity and cover” provided to the Jaish-e-Muhammed terror group by Pakistan, External Affairs Minister Sushma Swaraj said Wednesday as she forcefully raised the terror strike with her Chinese counterpart Wang Yi here. Swaraj’s meeting with Wang came a day after India destroyed a major Jaish-e-Muhammed (JeM) terror training camp in Pakistan. China, a close ally of Pakistan has repeatedly foiled India’s attempts to brand JeM chief Masood Azhar as a global terrorist by the UN. The JeM, founded by Azhar, has already been in the UN’s list of banned terror outfits. In 2009, India had moved a proposal by itself to designate Azhar. This was followed in 2016 when India moved the proposal with the P3 – the United States, the United Kingdom and France in the UN’s 1267 Sanctions Committee to ban Azhar, also the mastermind of the attack on the air base in Pathankot in January, 2016. In 2017, the P3 nations moved a similar proposal again. However, on all occasions China blocked India’s proposal on Azhar. “I am visiting China at a time when there is grief and anger in India. It is the worst terrorist attack directed against our security forces in Jammu and Kashmir,” she said in her opening remarks during the meeting held on the sidelines of Russia, India, China Foreign Ministers’ meeting. “The attack was carried out by Jaish-e-Muhammed, the Pakistan-based and supported terrorist organisation,” she said. Forty Central Reserve Police Force (CRPF) personnel were killed in a suicide attack in Jammu and Kashmir’s Pulwama district on 14 February, sparking outrage in the country and international condemnation. Following the incident, India bombed and destroyed JeM’s biggest training camp in Balakot in Pakistan’s restive Khyber Pakhtunkhwa province, about 80-km from the Line of Control (LoC) early Tuesday, killing a “very large number” of terrorists, trainers and senior commanders. Stating that the JeM is banned by the UN and other countries, Swaraj told Wang that “this terrorist attack is the direct result of the impunity and cover provided to the JeM and its leaders by the Pakistani side”. “After the Pulwama attack the entire UN has spoken with full voice to condemn it,” she said. Swaraj, who arrived here early this morning, told Wang that this is their first meeting this year and therefore an opportune time for the two sides to take stock of the bilateral relations and look ahead for cooperation. “This is our first meeting this year. Therefore, an opportune time for us to take stock of our bilateral relations and look ahead for cooperation. The India-China relationship is an important relationship for both of our countries,” she said. Referring to the Wuhan summit between Prime Minister, Narendra Modi and Chinese President Xi Jinping, Swaraj said “we have made substantial progress in relations”. “It is important for both sides to make sure the through and effective implementation of the guidance given by the two leaders,” she told Wang, adding that both side made efforts and “we should sustain this”. “Particularly the decision taken by our leaders to maintain strategic communication between them provided an important foundation for the development of our bilateral relations. This channel of strategic communication between the two of us and between senior officials should always remain open,” she said. Wang said last year’s Wuhan meeting between Modi and Xi led the bilateral ties into a new stage. “Led by the leaders, all aspects of our bilateral relationship are going well. Both nations and the international community are more optimistic of our bilateral relations. In 2019 we are going keep working on the consensus of the two leaders,” he said. Meanwhile, China on Wednesday again called on India and Pakistan to exercise restraint amid the escalation of hostilities between the two countries and urged them to engage in dialogue to uphold the peace and stability in the region. Chinese Foreign Ministry spokesman Lu Kang’s remarks came after Pakistan targeted military installations in India in response to Indian counter-terrorism strikes in Balakot. “I understand that in the latest development Pakistan says it had shot down two Indian aircraft and captured Indian pilots,” Lu told the media in Beijing. He said the international community is following the developments closely.